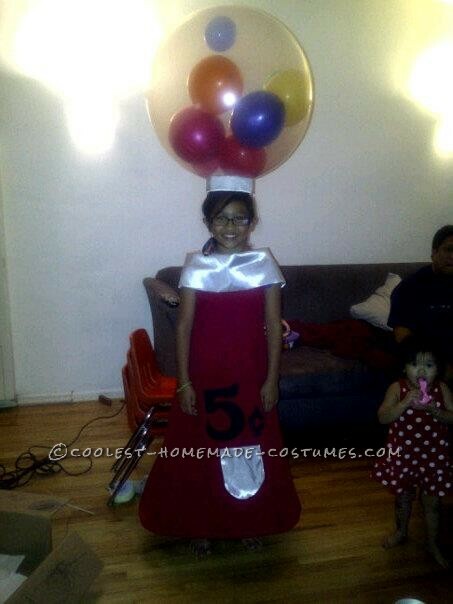 Most Awesome Homemade Pinata Costume Ever! I was inspired by the costumes from when I was a kid growing up in the 80’s. I remember the kids not really looking like a gumball. Just a clear garbage bag of blown up balloons, so I decided to take it up a notch. I’m also a professional balloon artist (no, not the kind that makes twisty animal balloons, I make sculptures and decorate large events) so I made my signature, Gumball Hot Air Balloon–but without the basket of course. I bought very inexpensive polyester red fabric, a small hoola-hoop, and one sheet of black felt from Micheals. The silver fabric I’ve had in my stash, but you can also buy inexpensive silver fabric. When I say “inexpensive”, it’s because I live right by downtown Los Angeles, and fabric there is dirt cheap if you know where and how to shop. I think I got about 2 yards of fabric just long enough to make it as tall as my daughter. I folded it in half then got one of her shirts to guide me where I should cut out the holes for her arms and neck. I stitched the sides together. Then I got the hoola hoop and stitched it on the bottom to give it that gumball machine shape. I took the silver fabric and made a shawl and a little flip door for where the gumballs are supposed to come out. With the black felt, I made a 5 cent sign. 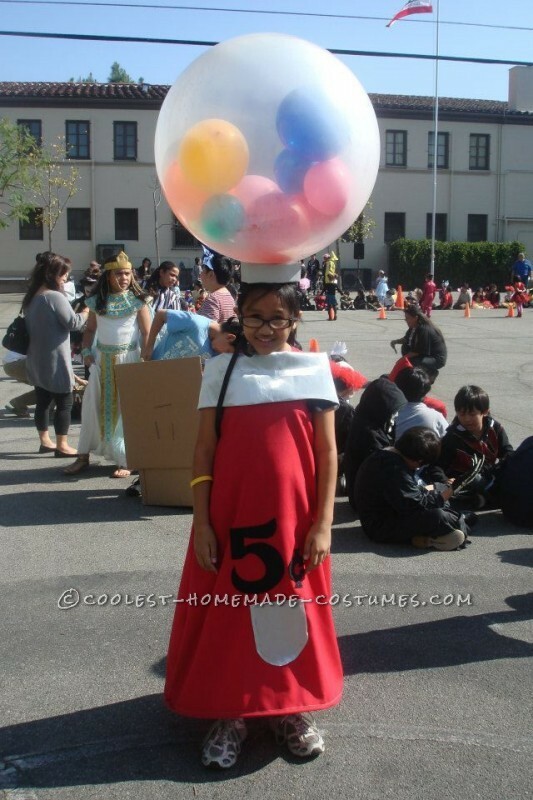 I blew up a 40″ clear balloon with balloons inside and made a mini hat. I hot glued the balloon on her head and voila! This is hard for me to describe how to make, but she got great reviews and she won the costume contest at her school too! She was stopped at almost every corner so some can take photos with her too.